The battered face of Formula One boss Bernie Ecclestone features in a new advert for a Swiss company, whose watch was stolen from him in a mugging last month. The 80-year-old was mugged by four people and also robbed of jewellery worth £200,000 ($315,000) in London. The advert was an idea from Ecclestone himself who sent it to the firm. The tag line quotes Ecclestone as saying: "See what people will do for a Hublot." "It is also a protestation against violence that we are all afraid of today." The adverts will run for three days this week in British newspapers. 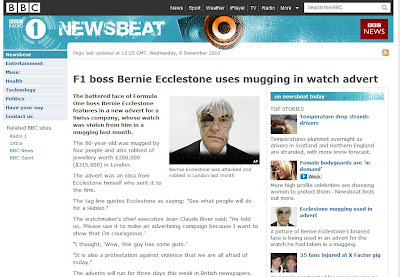 Bernie Ecclestone was taken to hospital after the mugging last month where he was treated for a minor head injury. Whatever the point/goal of this campaign. Its certainly unique and disruptive... which is fine by me. Protesting against violence is one thing but I'm sure the crux of the matter is PR and ultimately sales. In that respect its brave of a luxury brand to associate themselves with criminality in any respect - protest or otherwise. Interesting campaign, I will follow feedback closesly.